Drain fruit cocktail, measuring syrup; add water to syrup to make 3/4 cup. Dissolve gelatin in boiling water. Add syrup and lemon juice; chill until thickened. Stir in fruit. If desired, place cherries in molds to form carrousels. Pour gelatin into individual molds or a 1 quart mold. Chill until firm. Unmold on crisp greens. Makes about cups or 6 servings. Blend 1/2 cup Open Pit Barbecue Sauce with 1 can (10 1/2 oz.) condensed bean and bacon soup. Serve as a dip with crackers, corn chips, and crisp vegetables. Makes 1 2/3 cups. Sift flour, baking powder and salt. Beat eggs until thick, light. Gradually beat in 3/4 cup sugar. Add flour all at once; blend gently. Melt chocolate; stir in water, soda, and remaining sugar until thick. Quickly add to batter. Pour into 15 x 10-inch jelly roll pan – greased, lined with wax paper, greased again. Bake at 350° for 18 to 20 minutes. Invert on towel sprinkled with confectioners’ sugar, remove paper, trim, roll towel with cake. Cool 30 minutes. Remove towel, fill with Peppermint Whip, and reroll. Chill. Chocolate Mint Role is perhaps the best thing that’s come out of these cards and you don’t even have a pictured. 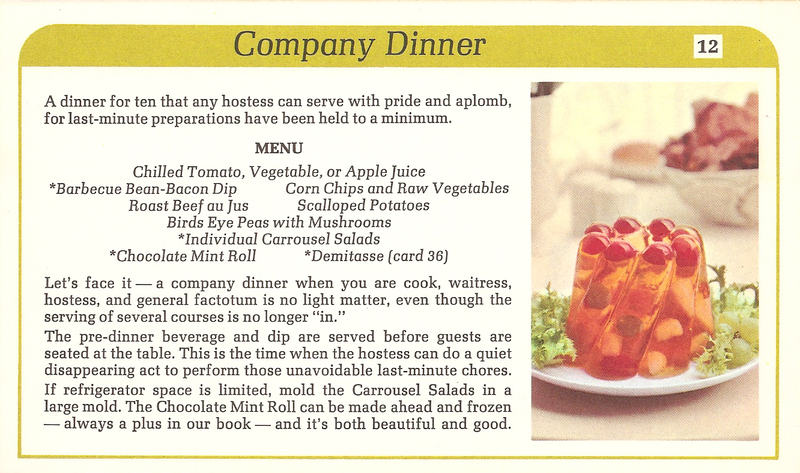 And where is card 10 with the recipe for the Peppermint Whip? Damnit! This could have been my birthday cake.